"Marty the cat purrs from both ends. Mary Jane first notices strange sounds 'pop out of his tush' at show and tell. The principal accuses him of being a skunk, and he gets the nickname 'Farty Marty'. But it soon becomes clear that Marty's pops are not of the everyday variety. Depending on his meal, he can expel an aria or a French love song. This, naturally, is a very marketable talent. And so kids are treated to the sight of Marty farting his way around the country (the funniest being Marty blinged out as rapper) and the world. All the fame results in the school being renamed for Marty and the suggestion that kids see if their pets have any talent in this area. Kellogg obviously had a ball with the illustrations. Everywhere you look, there' another hilarious spoof-an elegant commercial for La Farte; Marty singing atop the Sphinx while someone in the audience holds a sign that says 'Revive Cat Worship'; at the Brandenburg Gate, with Marty tooting 'Ich bin ein Berliner'. This one's a blast." "The illustrations are vintage Kellogg, and that is to say they are colorful, rich in detail, and energetically animated." "As always, Steven Kellogg's artwork explodes with vibrant energy and pizazz! One can't help but smile with delight at his exuberant, happy pictures." 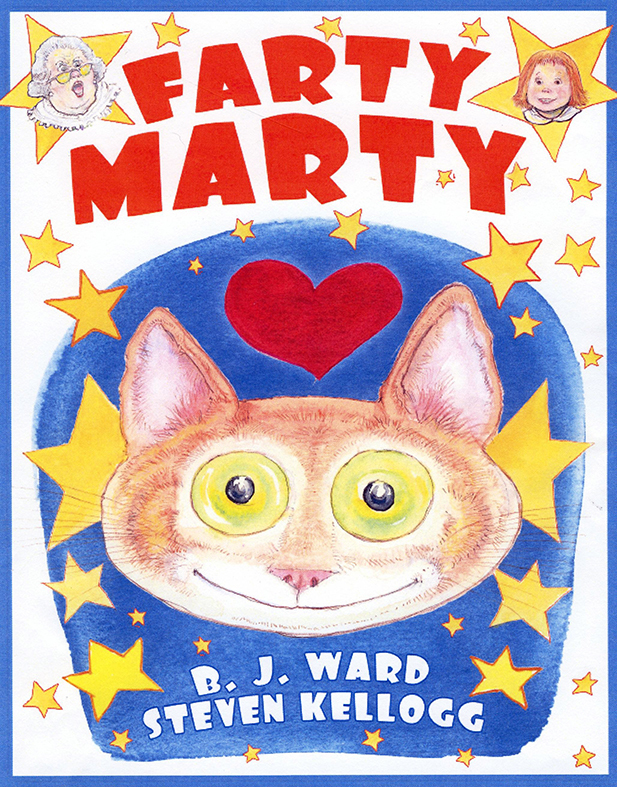 "Farty Marty is one of those rare picture books that entertains the adult as well as the child. With universal, ageless laughs and subjects, illustrator Steven Kellogg has again delivered images that will make this a book that will sing and toot for generations to come. Marty the cat is now a kid-in-all of us favorite."